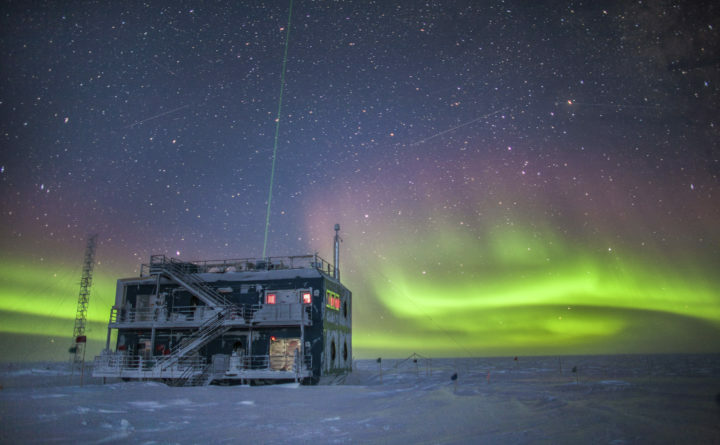 This undated photo provided by NOAA in May 2018 shows aurora australis near the South Pole Atmospheric Research Observatory in Antarctica. When a hole in the ozone formed over Antarctica, countries around the world in 1987 agreed to phase out several types of ozone-depleting chemicals called chlorofluorocarbons (CFCs). Production was banned, emissions fell and the hole shriveled. But according to a study released on May 16, 2018, scientists say since 2013, there's more of a banned CFC going into the atmosphere. Just weeks after the United Nations delivered a devastating report on the consequences of climate change, the U.N. offered cautious hope about another environmental disaster — the hole in the Earth’s ozone layer. Holes in the ozone, which captured public attention in the 1980s, are healing. The upper ozone above the Northern Hemisphere should be repaired by 2030, scientists reported Monday at a meeting in Ecuador. A hole over the Southern Hemisphere is closing more slowly and is expected to be covered by 2060. Although it isn’t time to declare victory (the use of some banned chemicals is rising in Asia), the ozone improvement shows the path the world must take to avert the current environmental disaster — climate change. That path includes heeding warnings from scientists, understanding — not downplaying — the risks and, most important, taking action. Scientists discovered that the ozone layer, gases high up in the atmosphere that protect the Earth from ultraviolet rays, was thinning in the 1970s. The ozone hole was caused by the use of chlorofluorocarbons, which were used as refrigerants in air conditioners and in aerosol spray cans. The public concern was fueled by worries about skin cancer and crop damage, among other problems, that could come from a thinned or depleted ozone layer. Another benefit of the Montreal Protocol, although it wasn’t clear at the time, was to slow climate change. CFC are powerful greenhouse gases that trap heat in the Earth’s atmosphere. Phasing out their use delayed the current consequences of climate change, perhaps by decades. Thirty years later, there is international consensus that climate change is a global problem. Nearly every country in the world has signed on to the Paris climate accord, an international agreement to lower emissions of greenhouse gases, which trap heat in the atmosphere. President Donald Trump has pledged to pull the U.S. from the agreement. He has argued that climate change is a hoax by the Chinese to harm U.S. businesses. He is abetted by climate deniers in Congress and industry-funded efforts to create doubt about climate change and fears that the U.S. economy will be harmed if the U.S. takes significant action to cut greenhouse gas emissions. Despite this rhetoric, many U.S. businesses are cutting emissions and becoming more environmentally friendly because it is good for their bottom lines. An important lesson from the ozone lesson is that certainty isn’t needed for leaders to take action, scientists say. “When Montreal was signed, we were less certain then of the risks of CFCs than we are now of the risks of greenhouse gas emissions.” Sean Davis, a climate scientist at the National Oceanic and Atmospheric Administration, said last year. “We don’t need absolute certainty to act,” he said. What is clear is that action is needed. Last month, the U.N. warned that humans have only 12 years to make dramatic reductions in greenhouse gas emissions before it is too late to slow the trend of warmer temperatures, rising sea levels, raging wildfires and widespread droughts. The calculus is simple — we can pay now in the form of investments in cleaner technologies and fuels — or pay later in deaths, upheaval and violence. The focus on the ozone hole shows that when action is demanded and countries work together, climate disasters can be avoided. It is past time to take that lesson to heart when it comes to climate change.